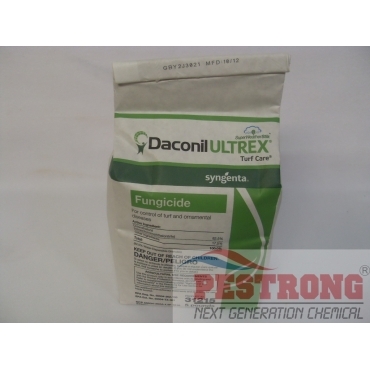 Where to Buy Daconil Ultrex Turf Care Fungicide, Daconil Ultrex Turf Care Fungicide - 5 Lb - $68.95 for Sale with Fast Free Shipping! Daconil Ultrex Turf Care Fungicide - 5 Lb provides excellent wide-spectrum disease control that exhibits a multi-site mode of action which can delay or prevent resistance to single-site fungicides. It contains a built-in surfactant to provide superior sticking power for extended coverage and unsurpassed protection on the crown and sheath of grass blades, even after heavy rains or watering. Broad spectrum contact fungicide which controls Dollar Spot, Leaf Spot and Brown Patch, Red Thread and Helminthosporium. Also effective on ornamentals for Blackspot, Botrytis, Mildew and Mold. If you want to cheaper product, use Generic Daconil. Just different manufacturer. Good product with great price.